Students who just signed their statements of intent to register at UCLA during Bruin Day 2016 pose with cheering staff and volunteers. 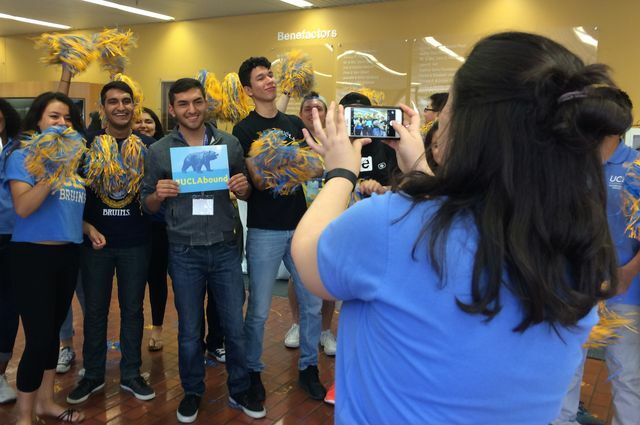 For thousands of newly admitted UCLA freshman, Saturday, April 14 will be a day to remember as they reflect on the results of hard work and sacrifices and look ahead to their lives as Bruins. Nearly 17,000 guests are expected to attend the first of two Bruin Day events designed to encourage prospective Bruins to see UCLA as an insider and to ultimately choose to enroll. A second Bruin Day — tailored specifically for newly admitted transfer students — will be held May 12. The April 14 event will feature three information fairs, more than 40 presentations, campus and housing tours, open houses, student performances, and compelling lectures from faculty members, including Robert Watson, professor of English; Gaye Johnson, associate professor of Chicana and Chicano studies and African American studies; Jay Phelan, professor of ecology and evolutionary biology; and Richard Kaner, a distinguished professor of chemistry and of materials science and engineering. Watson, Phelan and Kaner are all past winners of UCLA’s Distinguished Teaching Award. Students will also hear from campus leaders and preview some of UCLA’s more than 1,000 student clubs and organizations, as well as the university’s offerings in the arts, culture, athletics and recreation. In addition, an informative presentation focused on first-generation college student resources will be held in support of UCLA’s commitment to helping first-generation students achieve academic success, foster a community and make the most of networking opportunities. A highlight of the day for admitted students who submit their statement of intent to register will enjoy exclusive access to the admission lounge in the Wooden Center, where school mascots Joe and Josie Bruin will be eagerly waiting to take photos with these new Bruin family members. 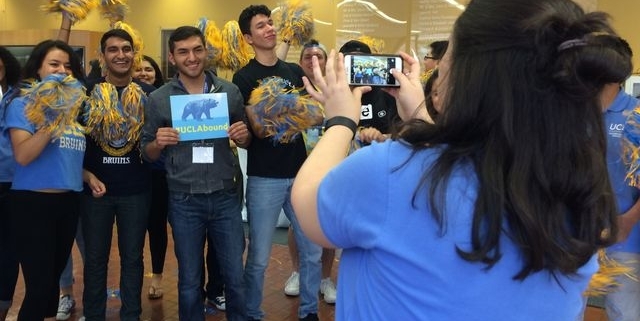 Attendees can follow UCLA on social media and tag their Bruin Day photos and videos with the hashtag #UCLAbound.